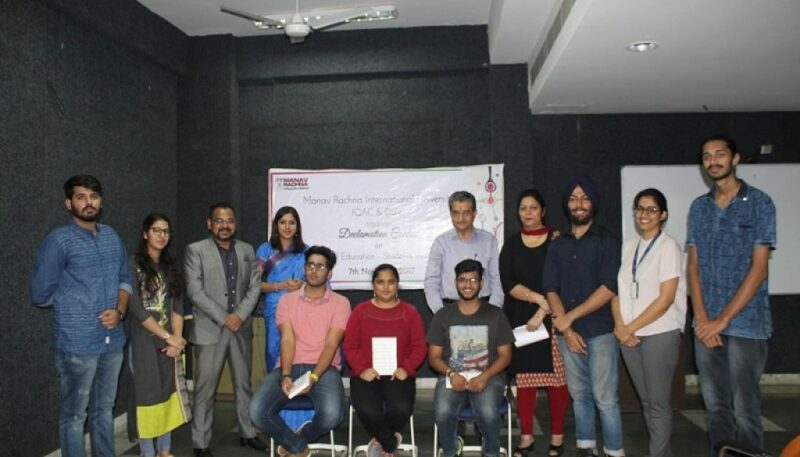 Department of Students Welfare on behalf of IQAC, Manav Rachna International University organized an Declamation Contest on the topic – “Quality of Education”. Whether it be academics or cultural activities, students of Manav Rachna have always showcased their best and once again proved them by participating in this literary event. The event was witnessed by Dr. I.K. Kilam, Dean Students Welfare, Ms. Gurjeet Kaur Chawla, Asso. 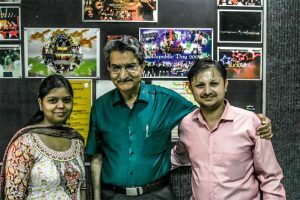 Dean Students Welfare, Mr. Virender Narula, Prof. Mechanical Department and our esteemed judges Mr. Nitesh, Member CDC, Chairperson of Manav Rachna Literary Society and Ms. Ritika Singh, HOD, Hotel Management, Chairperson Social Services Manav Rachna. 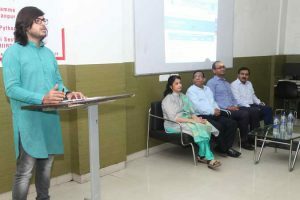 Event took place with a brief Introduction about what is “QUALITY OF EDUCATION”, where Dr. Virender Narula explained the parameters of “Quality” by giving example of daily life products. This was followed by a brief introductory address by Dean Students Welfare, Dr. I.K. Kilam who started the purpose & objective of holding such a contest programme among students against the backdrop of action points emerged out of IQAC meeting minutes. One after another participant came on the dias and shared their views on the topic. Participant Deepanshu Miglani shared that Education and Knowledge both play a vital role in one’s life, he also mentioned that according to current curriculum Education is not on cramming lessons, but is to learn things practically. Another student shared his views that as education is important for survival, similarly extracurricular activities are important to built personalities. After these wonderful mind thoughts of young students, everyone appreciated their views and said that today’s 30% well educated students can educate 100% of the population of India. With the ending of the event results were announced by the judges and the dignitaries present on the occasion. 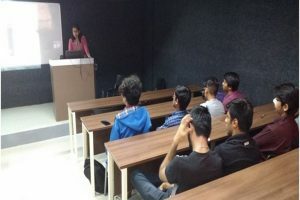 Ms. A. Parul Sharma, 1st year B.Tech CS, FET, MRIU from Water Sharks bagged the First position followed by Mr. Yuvan Saluja, 2nd year B.Tech C.S, MRU from Forest Rhinos and Mr. Aditya Sharma 2nd year B.Tech CS FET, MRIU bagged the 2nd and 3rd position respectively. Mr. Nitesh Shankar, Chairperson of Manav Rachna Literary Society shared his compliments that every mind has new thoughts and these thoughts can make the country better. Also, he added to his talk that next time an event can be conducted where rather than claiming for the problems, students can suggest the new ways of improving the QUALITY.